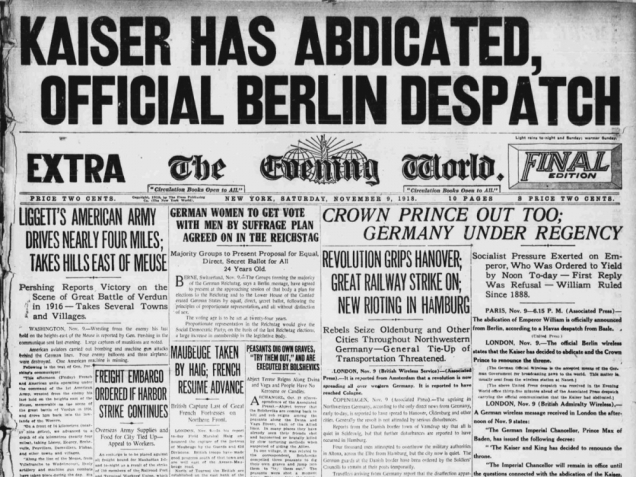 Kaiser Wilhelm II was dethroned in the November Revolution by his chancellor Max von Baden, who published the news before the emperor had actually abdicated. The same day Philipp Scheidemann proclaimed the German republic from a window of the Reichstag, keen to proclaim the republic before the communists did. He just beat Karl Liebknecht, who proclaimed a “Free Socialist Republic” from a balcony of the Berliner Stadtschloss. 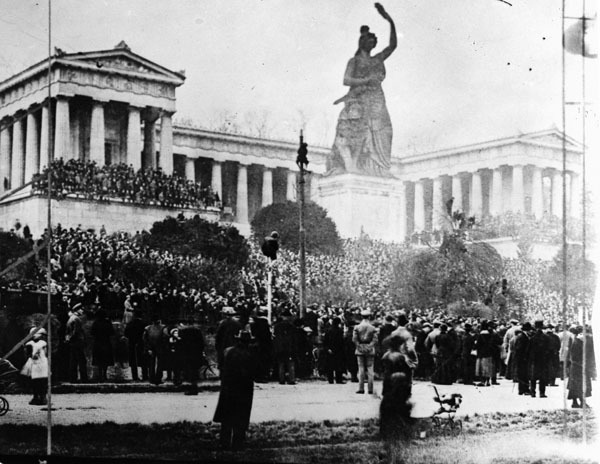 In 1923, the failed Beer Hall Putsch, from 8 to 9 November, marks an early emergence and provisional downfall of the Nazi Party as an important player on Germany’s political landscape. Without sufficient preparation Hitler simply declared himself leader in Munich, Bavaria. Hitler’s march through Munich was stopped by Bavarian police who opened fire. Sixteen nationalists and four policemen were killed. During the Nazi rule 9 November was a national holiday in Germany in memory of the Nazis who died in the beer hall Putsch. In 1938, in what is today known in German as Kristallnacht (“Night of Broken Glass”), from 9 to 10 November, synagogues and Jewish property were burned and destroyed on a large scale, and more than four hundred Jews were killed or driven to suicide. The event demonstrated that the antisemitic stance of the Nazi regime was not so ‘moderate’ as it had appeared partially in earlier years. After 10 November, about 30,000 Jews were arrested; many of them later died in concentration camps. 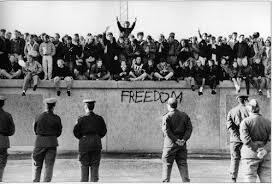 In 1989 the fall of the Berlin wall ended German separation and started a series of events that ultimately led to German reunification and the Fall of Communism in eastern Europe. November 9 was considered for the date for German Unity Day, but as it was also the anniversary of Kristallnacht, this date was considered inappropriate as a national holiday. The date of the formal reunification of Germany, 3 October 1990, therefore, was chosen as the date for this German national holiday instead, to replace 17 June, the celebration of the uprising of 1953 in East Germany. How fascinating, Christoph. Many thanks for this! Thank you for this Christoph – it is so important to keep history alive, the good and the bad in the possibly vain hope that mankind will learn for it and make a better world. How fascinating that so many historic events happened (over the years) on that day. This is a marvelous post, Christoph. Your remark about “the fragility of life and politics” is astute and poetic. Hugs. This is a fascinating article, Christoph – and so important to remember such significant events.